The SRS Series is designed for system sizes handling 25-250 gallons per hour and features scrapers and immersion heaters in a large capacity oil bath. The system offers optimal performance in most applications. This design incorporates a unique self adjusting scraper assembly which agitates the solvent for even heat distribution, and keeps the inside surfaces of the distillation chamber free of sludge build-up for maximum heat transfer from the hot oil media. Scrapers also assist in discharging the sludge from a bottom mounted 6″ discharge valve. Vessel Design: Unlike typical flat bottom or straight side, dished bottom stills, SRS provides a true cone vessel. Models SRS have 60° cone vessels. This design allows proper heat distribution and ease of residue removal. This design has more heat transfer area at the top of the cone. As sludge accumulates, it naturally drops to the bottom of the cone leaving the larger surface area at the top to keep on distilling at optimal efficiency. Under these conditions, the sludge is always submerged in solvent and acts as an additional safety feature with reactive materials such as nitrocellulose. PLC controls: SRS offers an assortment of PLC systems. All programs and listings are made available to the user for on-going maintenance. Set points and temperature ranges are preset at the factory, and are protected by password access. This password control is passed on to the user to be used only by authorized personnel. Self Adjusting Scraper Blades: Model SRH. The unique self aligning, flexible “wrist” design assures proper leading edge scraping of the vessel heated surface. This ensures a continuous contact with the inner walls of the unit at all times, requiring no external adjustments. The support hub is located above the residue discharge area to prevent interference during discharge. The massiveness of the wear surface provides long life. Material of Construction: Both the vessel walls and the outer shell are stainless steel. The elevated stand, platform and ladder are also of stainless steel. High Efficient Condenser: Made of stainless steel type 316, the “Flat Plate” design provides exceptional heat transfer area thus establishing an efficiency rating far above the standard shell and tube condenser designs. Precise Temperature Controls: RTD temperature sensors are provided in the vapor space, heating medium and the sludge and are monitored and controlled within a pre-determined range by the PLC. RTD’s are accurate to within 1 to 2 degrees F. Sludge temperature control is the only accurate way to establish its consistency, since it becomes hotter as it thickens. Discharge condition is controlled accurately through this temperature sensing, initiating auto cool down cycle which alerts the operator to empty the residue. Sludge temperature control is key to the safe distillation of waste solvent contaminated with nitrocellulose. Auto Cool: For operator safety and VOC minimization, all SRS systems are available with an auto cool option. Before discharging, the sludge should be rapidly cooled to a safe temperature, typically from 100-150 degrees F. After discharge, the system is immediately ready to be reloaded with solvent to continue the process. This shortens the discharge time by several hours for a more effective use of the system. Heating Methods: The model SRS Series can be heated with Steam or Electric heaters. 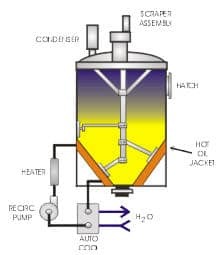 The heating medium is high efficiency heat transfer oil which is recirculated in a jacket around the distillation vessel. By providing pre-heated medium with an even distribution of heat, there is less chance for hot spots and less volume of heating medium is required. The auto cool option is accomplished through an in-line heat exchanger in the recirculating loop. Vacuum: Optional vacuum systems with a secondary condenser for maximum VOC control. 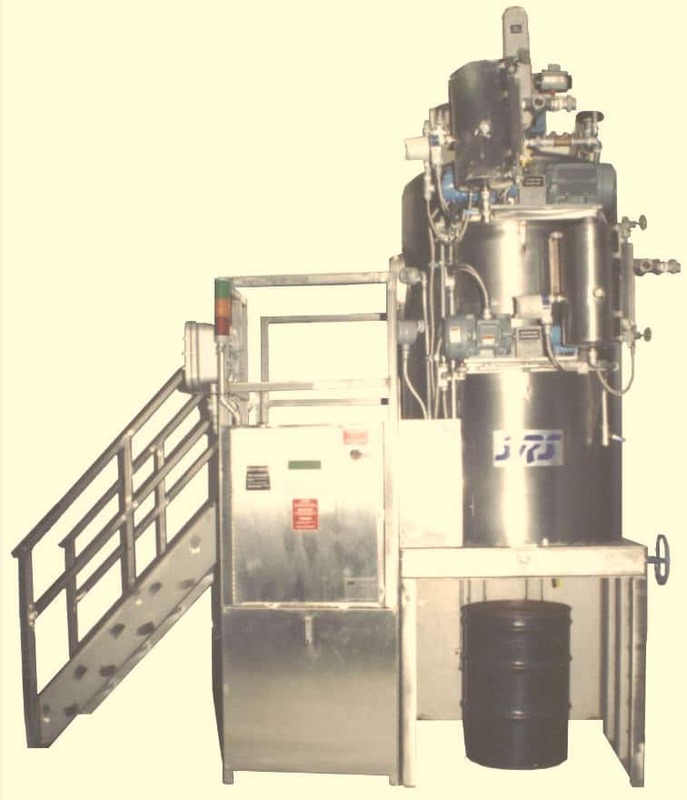 Includes a 3 HP Liquid Ring vacuum pump, decanter, sight glass under PLC control. A secondary condenser is used to virtually eliminate VOC emissions from the vacuum system. The vacuum is mounted on the distillation system to reduce the effective boiling temperature for safety and efficiency. An added benefit of this vacuum system is the fact that it can be used in the auto load operation instead of a pump. Auto Fill: Vacuum fill or optional pump fill system with electronic level sensor to maintain operational level within the distillation vessel. In addition to the level sensor control, all SRS systems have a secondary level of safety by incorporating a PLC driven watch dog timer feature, which stops the auto fill action upon the expiration of the allocated time, both for an initial fill (typically 10 minutes) and consequent refills (typically 2 minutes). This ensures against accidental overfilling. Sludge Discharge: All series of distillation units use a bottom mounted large capacity 6” or 8” manually operated discharge valves. Class 1, Division 1 or ATEX Option for Hazardous applications: Explosion resistant air (or nitrogen) purged NEMA 4X Control Panel with pressure differential sensor mounted on a NEMA 7X junction box. Purge pressure loss sensed through the PLC will shut power off to the unit. NEMA 7 compatible junction boxes, conduits and components are utilized. Nitrocellulose Package: The Nitrocellulose control package is required when Nitrocellulose is present in materials being distilled to prevent a Nitrocellulose Reaction typically found in the printing industry. Interlocking safety devices on all components. Explosion resistant designs and components. 5 PSI pressure relief valve. Single Point Utilities Connections: Minimal installation time and cost. Units are skid mounted, pre-shipment assembled and tested. All systems are wet tested at the factory before shipment. Solvent Tank Designs: SRS offers conical bottom vertical tank designs (typically 500 gallons) fabricated of 304 stainless steel, which feature small footprints for optimal use of space. Optional recirculating and fill pumps can be fitted to the dirty solvent tank to keep solid sludge from building up at the bottom. Automated transfer pumps are available to suit the application. All tanks have clean out hatches, venting ports, a sight glass, and accommodations for three level sensors.